beautyandbrains007: I've been busy... My January 2016. empties! I've been busy... My January 2016. empties! I am very happy to be with you again and thank you if you really are here - still. Due to my hectic schedule the only thing I can honestly promise you is that when ever I will find the time to hang out with you by posting mine or reading your posts, I will! 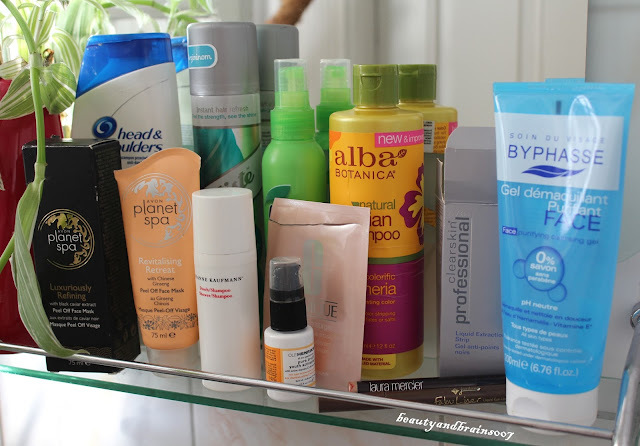 It may be a little selfish, but I really want to write about my January empties first. These posts make me happy, especially this time of year, when we all are in the mindset of less is more. 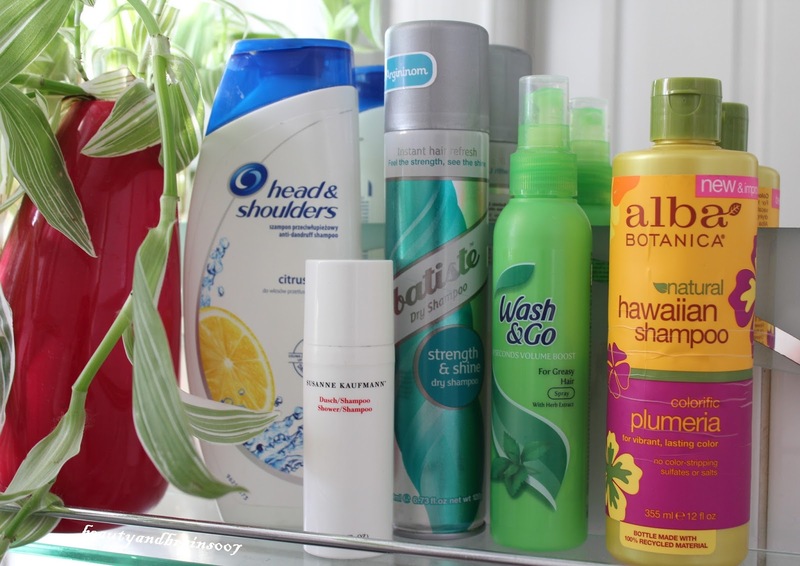 Since October of 2015., when I last published my post, there were many empties. So many that it became overwhelming, so I decided to make a fresh start and write only about this year's ones, starting January. I am dividing them into three groups: body/hair care, face care and make up. Looking at them like this, I realised that most of them are hair products. 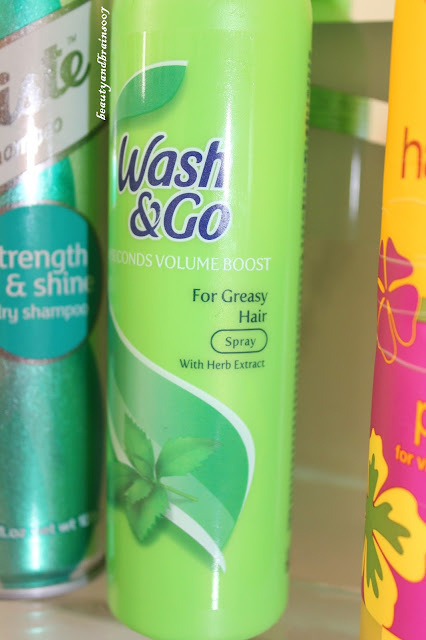 Some from my all time favourites category, like Head & Shoulders shampoo that I use once a week in order not to get dandruff (it works) and Batiste Strength and Shine dry shampoo which is my favourite product of this kind, from the ones that are easy accessible for us in Croatia. Then, there are products which were new for me like Alba Botanica Natural Hawaiian shampoo - colorific plumeria. By the manufacturers claims it protects your hair colour (if your hair is colour treated), and it contains no sulfates or salts. These products were available in DM, but aren't anymore. I bought them while they were on sale. Their sale prices where like their normal prices on iHerb. Although this wasn't a bad shampoo, it wasn't spectacular either, so I don't think I'll be buying it again or ordering it online. For your reference, my hair is long, greasy and colour treated. It did protect my hair colour but didn't fully get along with its greasiness. Another product that I haven't seen on the shelves of our stores is the Wash & Go 10 Seconds Volume Boost spray for greasy hair with herb extract. 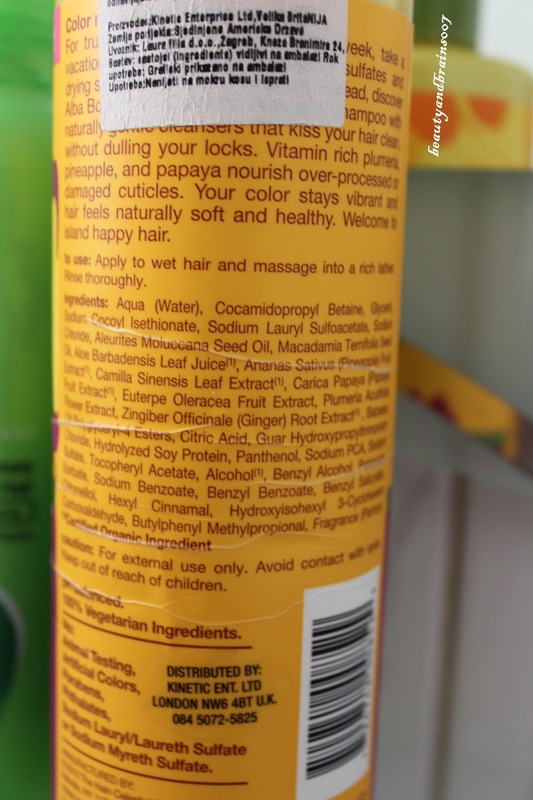 I bought this product in Bosnia along with a shampoo from the same line. Shampoo was OK and I used it up completely, but this spray did absolutely nothing for my hair. It didn't prolong the time between two washes or made my hair more voluminous, so I am getting rid of it. 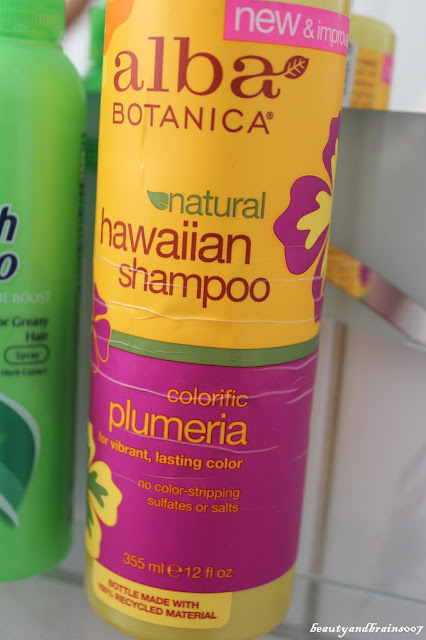 It should be used on the roots of your hair while it is still wet/damp and then you should dry your hair using hair dryer. Been there, done that, no results, so my verdict is to skip this one! 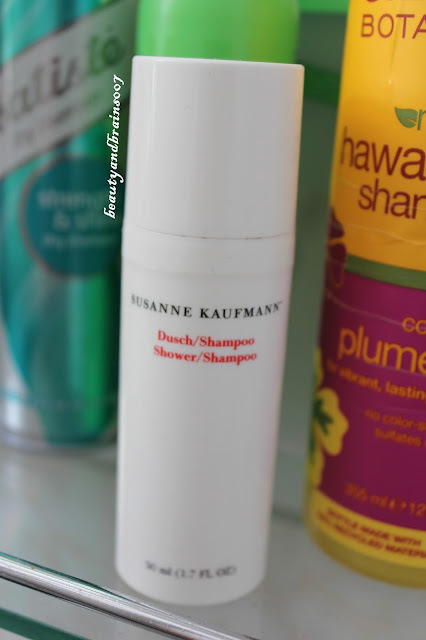 And the last product from this hair/body care category is a sample of a shower/shampoo from Susanne Kaufmann range that I received in my last year's Net-a-Porter Holiday Kit. I mainly used it as a shower gel, only twice on my hair although it wasn't bad for it either, and I love its very unisex, mild scent. But, there is a downside. Because of its high price I don't know if or when will I buy it again? In my face care category there are a lot of Avon's products. Partly because I have been using them for years and partly because I wanted to use these up. In any case, I tried many varieties of their face masks, so it is no wonder that there are two here. 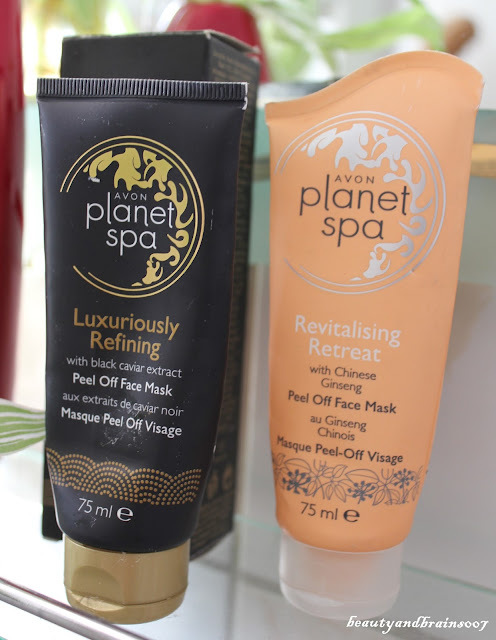 Their Luxuriously Refining Peel off face mask with black caviar extract is suprinsingly yellow, almost gold, and it was better for me than the other one - Revitalising Retreat with Chinese Ginseng. As I said, they are both peel off masks which will improve the state of your skin and tone it a little bit, but they are not super effective, and the results they do provide aren't long lasting. 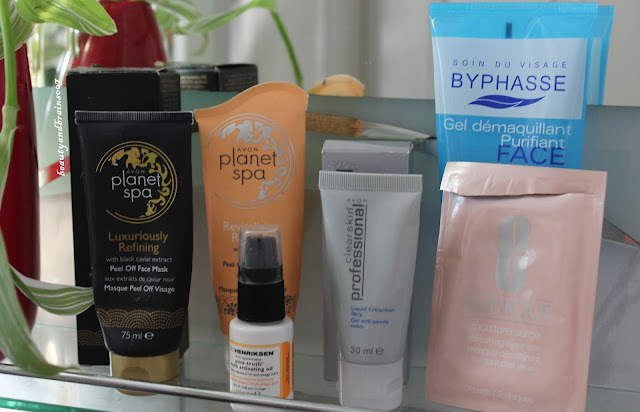 Well, I admit that they were excellent for my skin when I was younger, but now when I am dangerously close to turning 35, they just don't have the same effect. Therefore, after trying so many face masks from other brands, I must say that these won't make me open my wallet again. 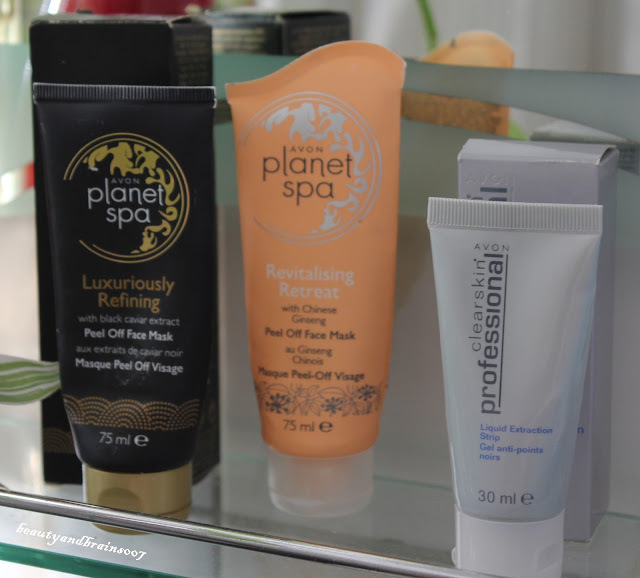 Oh, and I think that you all know the story behind peel off face masks but just to be safe... At first they have gel consistency which forms a layer, like a second skin when it dries on your face, and then you just peel it off. Don't be too persistant on your brow area or any other hairy parts, wash it off there. 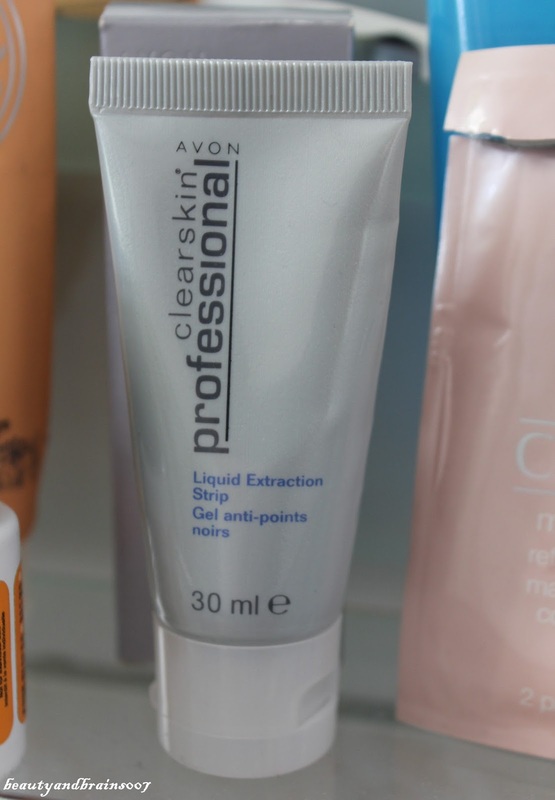 Another product from Avon with similar peel off concept is their Clearskin Professional Liquid Extraction Strip. If you have enlarged pores on your nose, chances are that you have tried strips for removing blackheads from that area. Well, the concept is the same with this one, but it is a liquid - gel which you apply on your nose and when it dries and hardens, you remove it like you would remove an ordinary strip. Well... I can tell you that this stuff is serious. My number one advice for you is NOT TO PUT IT anywhere near your nostrils. It will hurt!!! And I didn't intentionally put it somewhere around that area, and the amount was nearly nonexistent... Anyway, it hurts and this shouldn't get on any sensitive areas on your face. Even more, if your skin is sensitive in any way, STAY AWAY FROM THIS ONE! One would think that since it is so strong, that it cleans those blackheads like a dream. WRONG! So, by now you are probably aware of the fact that I don't like this product and wouldn't recommend it. My tube is almost full but it is going straight to the garbage. Last year there was a real buzz about Byphasse product that became available in Croatia. Since all the bloggers raved about them, I was convinced that I need them in my life, too. So, after a quick stop to DM, an eye make up remover, cleansing gel and micellar water were in my possession. Eye make up remover is long gone and I hated it, micellar water was not bad, and here you can see their make up removing cleansing gel which was also OK. 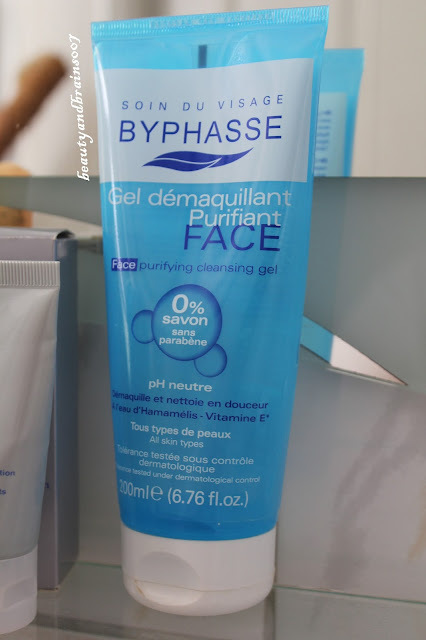 It has a thicker consistency than most of gel cleansers and because of that it really made a difference when I used it with my Foreo which glided smoothly over it. I liked it, it didn't dry out my skin at all and I would buy it again. 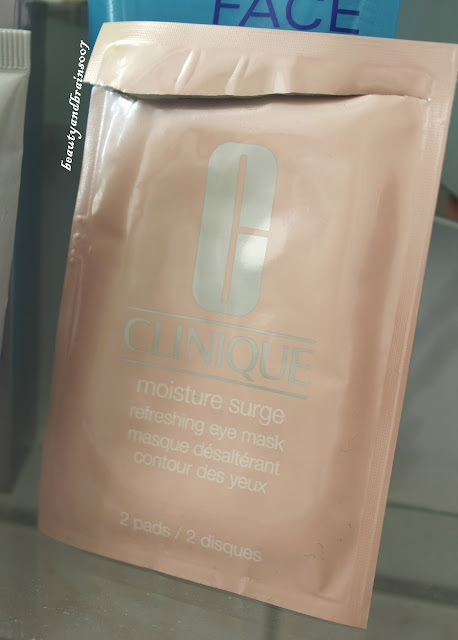 I have also used up a pair of Clinique Moisture Surge eye pads. 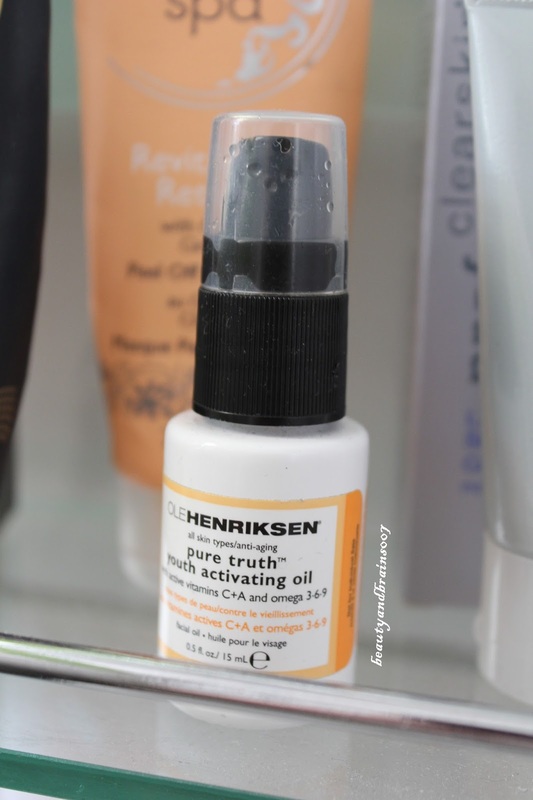 I love stuff like this because they bring moisture back to my sensitive eye area. 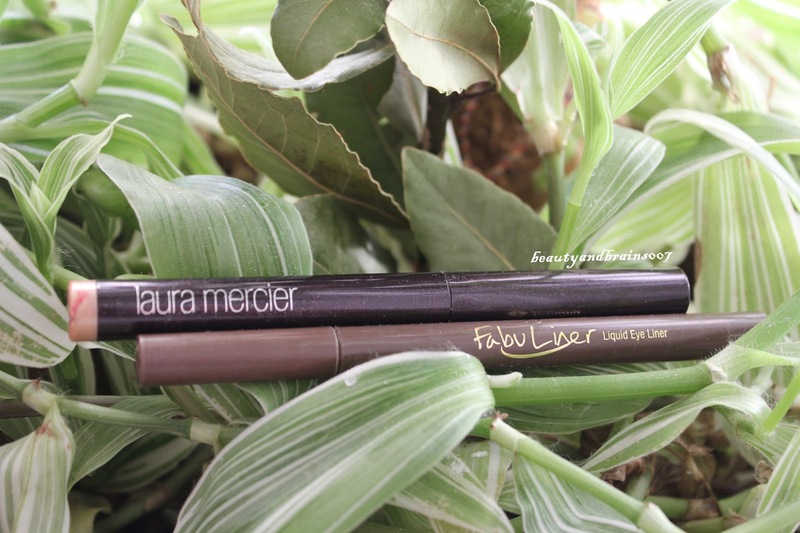 These aren't bad, they hydrate and refresh your eye area, I have a few left and I would buy them again! The last face care product that I finished is a bottle of Ole Henriksen Pure Truth Youth Activating oil with vitamines C and A and omega 3-6-9. I received it in one of the beauty boxes from Lookfantastic (here). This oil is great!!! BUT... It stinks!!! On my skin it smells like a stew with onions and it only gets worse with time. Further more, its scent lingers so sometimes I felt that I can't get away from it. In the end I finished it but it wasn't easy. And no, I will not buy it again! And lastly make up. Probably what you are most interested in. There are only two finished products in this category. The Jordana Liquid Fabuliner (brown) which was amazing, just pigmented enough for the day and longlasting on my eyes. We don't have Jordana products in Croatia, I ordered mine online and this one was really nice. The other finished product is Laura Mercier Caviar Stick in the shade Rosegold. I tried only two shades - rosegold and amethyst, but they both wowed me. I prefer amethyst but just as a personal preference because I like this shade on my eyes a bit more. 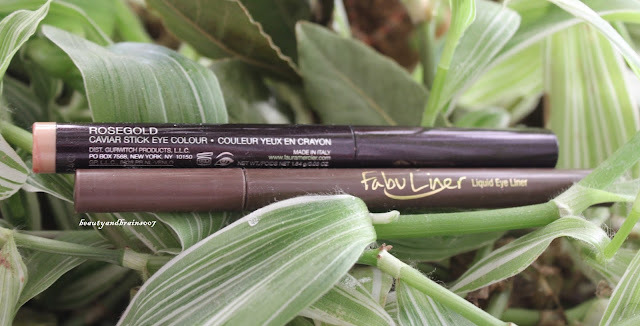 Saying that, both of these are amazing, pigmented, longlasting and I can really say that you need to try them if you get a chance. That is it from me for now. I am planning to write about my Favourites as well and also want to publish a New in post. All the new in products were bought during 2015., some of them are gone already but just to keep you posted. What do you say? Have you tried any of these? Do we share experiences or you loved the ones I didn't and vice versa? Lovin all of your picks here!